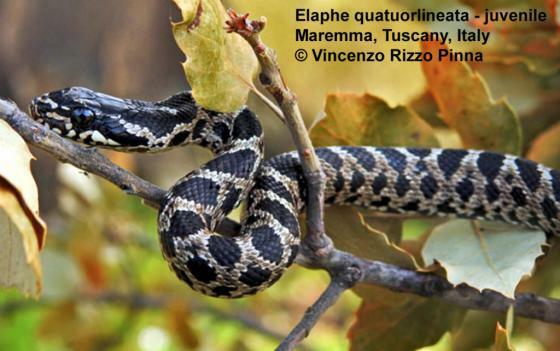 Can you confirm these amateur observations of Elaphe quatuorlineata? rechingeri: Greece (Amorgos Island); Type locality: Inseln Amorgos, (süd-östliche Cycladen), Cycladenarchipel” [= Amorgos Island, cenral Cyclades, SE Greece, bet. 36°46’–56’N & 25°44’–26°05’E]. 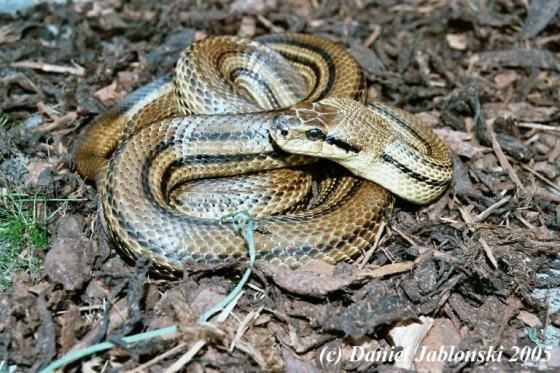 Comment Illustration of Elaphe quatuorlineata muenteri in CIMATTI (2003). Subspecies: Elaphe quatuorlineata sauromates is now treated as full species. Kornilios et al. 2014 support the recognition of three genetic lineages that roughly correspond to the morphological subspecies, although they recomment to re-evaluate the morphological characters used for their discrimination. However, the status of parensis remained unclear in this study due to the lack of samples. Wallach et al. 2014 cite Clark 1994 as source for the validity of E. rechingeri. Pattern: While adults have longitudinal stripes, juveniles have oblique blotches. The type locality in Lacepède (1789) is given as "Provence, France" in error for that species. 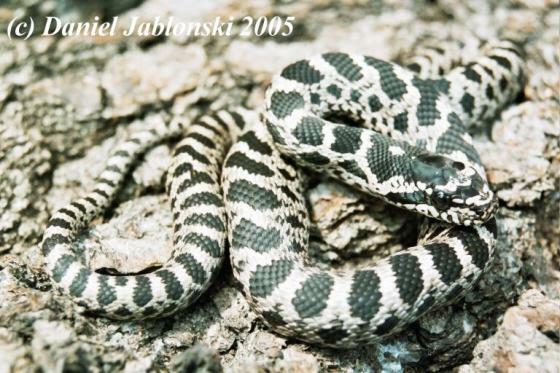 It might be that the type specimen was in fact a Elaphe (now Rhinechis) scalaris (See Böhme & Scerbak 2003). Bonnaterre's description (1790) is based most probable on the same specimen. Lacepède's Work (1789) is rejected as invalid for Nomenclature (ICZN 1987). The next valid description is that of Bonnaterre (1790). Clarification of this complex nomenclatoric problem is needed. Distribution: listed as questionable/possible for Jordan by DISI et al. 2001. Reports from Romania are E. sauromates (previously E. quatuorlineata suaromates). Not in Syria (as reported by BERGER -DELL’MOUR 1986); reports from Syria are E. sauromates. 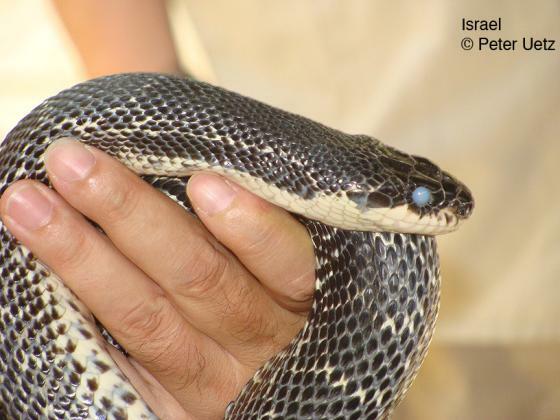 Type species: Coluber quatuorlineatus LACEPEDE 1789 is the type species of the genus Elaphe BONNATERRE 1790. Berthold, M. 1976. 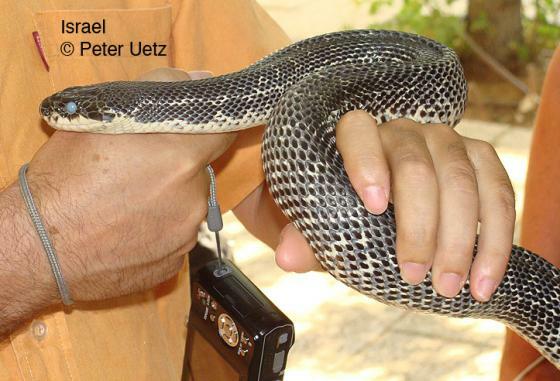 Beobachtungen bei Elaphe quatuorlineata sauromates. Aquar. Terr. 23, 314. Daudin, F. M. 1803. Histoire Naturelle Generale et Particuliere des Reptiles. Vol. 6. F. Dufart, Paris. Werner, F. 1932. Eine neue Schlange aus dem Cycladenarchipel. Anz. Akad. Wiss. Wien, math. naturwiss. Kl. 69: 232.